BLUE SKY AND SUNSHINE: Nothing but sunshine across Alabama this afternoon with temperatures mostly in the 50s over the northern counties, with 60s to the south. Tonight will be fair and chilly with a low in the 30s. The air stays dry tomorrow; we will forecast a partly sunny day with a high in the mid 60s. FRIDAY AND THE WEEKEND: A surface front will approach our state from the north Friday; the day will be mostly cloudy with a few scattered showers. We aren’t expecting anything really widespread or heavy; and the day will be mild with a high in the mid to upper 60s. Not much change Saturday as the front stalls out near the Tennessee state line; expect a mostly cloudy sky with a few passing showers possible. Not an “all day” kind of day, and temperatures will be pleasant with a high back in the 60s. The coverage of showers should be higher on Sunday as a wave of low pressure tracks along the front; but there will still be breaks in the rain. And, Sunday should be pretty mild with a high between 67 and 70 degrees. Not bad for the middle of February. NEXT WEEK: We will maintain some risk of scattered showers Monday, but rain should be widespread across the state Tuesday with a wave of low pressure moving along the Gulf Coast. The rain should end early Wednesday, and for now the rest of the week looks dry. See the Weather Xtreme video for maps, graphics, and more details. 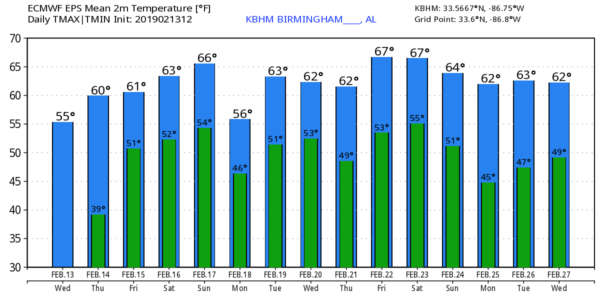 And, for now, no sign of any issues with severe thunderstorms, extreme cold, snow, or ice across Alabama for the next seven to ten days.